The Bayern Munich striker scored twice against Benfica to reach his half-century. Robert Lewandowski's brace against Benfica on Tuesday night took the Bayern Munich striker past 50 Champions League goals. The Poland star is only the seventh player to reach the landmark in the competition proper and here, Press Association Sport takes a look at the exclusive club. A five-time Champions League winner and seven times the competition's top scorer, Ronaldo has pulled clear of even his long-time rival Lionel Messi in the all-time list. He also holds the top three season goal tallies, including an all-time record 17 for Real Madrid in 2013-14. 📅 #OnThisDay in 2005...⚽️ Teenager Leo Messi scores his first #UCL goal! The Barcelona star is the only other man in three figures, has been top scorer on five occasions including every season from 2008-09 to 2011-12, is one of only two players to score five goals in a main-draw game and has a record eight Champions League hat-tricks to his name. His side have lifted the trophy on four occasions. Ronaldo's predecessor as Real's main goal threat, the Spain international maintained a record of a goal every two games as Los Blancos won the competition three times in his 16 years with the club. He was the Champions League's leading scorer in 2000-01, having tied for the honour the previous season. Real's former France striker has never scored more than seven goals in a Champions League campaign but his consistency sees him high up the rankings – he has scored at least four every season since 2010-11 and is already on three for the current campaign. The Dutchman enjoyed his most successful years with Manchester United and was the Champions League's leading scorer in three seasons out of four in the early 2000s. 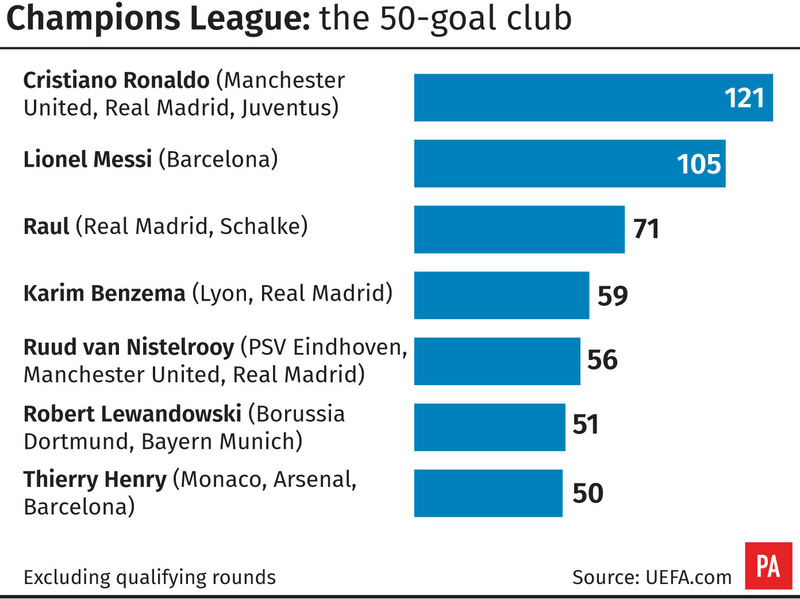 He was also the quickest man to 50 Champions League goals, reaching the mark in 62 games. Lewandowski is the third-quickest player to 50, behind only Van Nistelrooy and Messi (66 games), and has helped Bayern reach the semi-finals in three of his four seasons at the club prior to this term. The former France star scored 35 of his Champions League goals for Arsenal, with the rest split between Monaco – where he is now head coach – and Barcelona. He won the competition in 2009 with Barca, who had beaten his Gunners side in the 2006 final. The pair each have a half-century to their name when the qualifying rounds are included, with Shevchenko on 59 and Inzaghi – who in 2010 became the third-oldest goalscorer in the Champions League era – 50. An integral part of the Real side who won the first five European Cups, Di Stefano scored in all five finals and managed 49 goals in the competition in total, in just 58 appearances.